If you’ve mastered the skill of walking while tweeting, you’re probably going to love the latest invention out of Kenya. 24-year-old Anthony Mutua has developed a recharging sneaker that can power your phone, preventing you from having to pause and plug it in during the day, when you’re on the run. 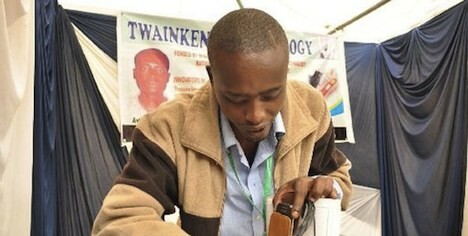 He debuted this device at the first-ever Kenyan Science Technology and Innovation Week in Nairobi. The small device has a very thin crystal chip that generates energy from pressure, every time you take a step and bend the sole. Phones can either be charged via a cable that goes to your pocket, or power can even be stored for later charging. Sounds like a pretty great way to generate and store some power if you’re a regular runner, sports player, or gym–goer. The crystal chip works with any type of shoe except bathroom slippers, and you can transfer it to another shoe once you wear a pair out. If you’re wondering how to charge your Android AND your Blackberry (do people still use those?) simultaneously, the device can also power several phones at once. The technology has been patented and is likely to enter mass production soon. It will probably sell for about US$46. Would you use your shoes to power your electronics? Next post: Big First Quarter Of 2012 For Electric And Hybrid Car Sales In U.S.